Whether fabricating color-matched dirt for a layout or studying U.S. topographical reports to achieve a precise scale, model railroaders strive for accuracy and authenticity. While there are a number of cities that boast clubs and manufacturers, Milwaukee is arguably the historical headquarters of model railroading. One of the nation’s oldest model railroading organizations, the Model Railroad Club of Milwaukee, has, appropriately enough, made a defunct railroad station in Walker’s Point, just south of downtown, its clubhouse since the mid-1930s. A small team of engineers operates the trains that run over its two thousand feet of track, one of the nation’s largest designs when it was created in the late 1970s. This design was the work of an organization whose members had helped shape the course of model railroading in the early 1930s. In 1934, William K. Walthers, a local modeling railroading enthusiast and entrepreneur, began marketing parts and electrical equipment to model railroaders. 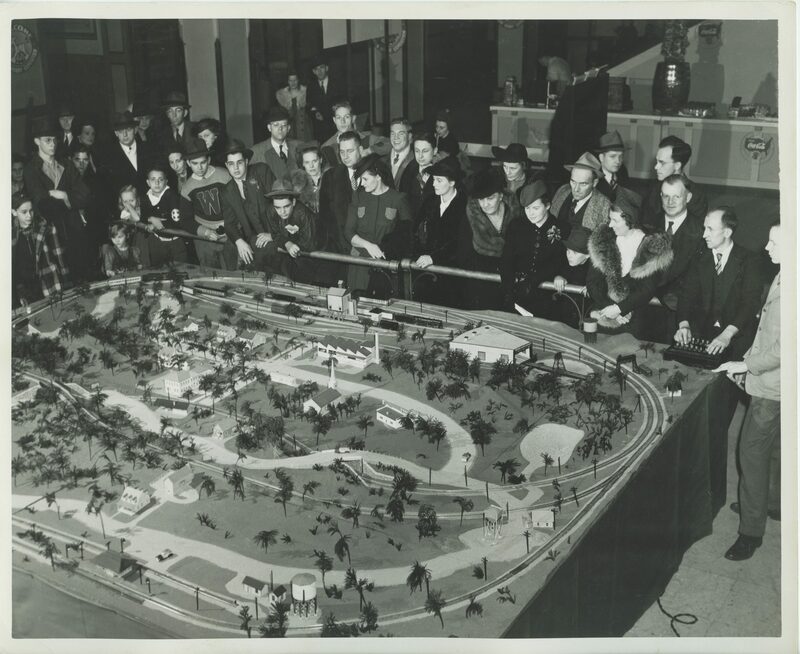 The following year, Walthers, along with fellow train enthusiasts Albert C. Kalmbach and future Milwaukee mayor Frank Zeidler formed the Model Railroad Club of Milwaukee. Kalmbach counted Walthers among his first advertisers when he began publishing Model Railroader in 1934, which became the hobby’s principle national monthly publication. A fourth, and equally enduring institution, emerged in 1935 when Kalmbach, Walthers, and Zeidler founded the National Model Railroad Association (NMRA) in an effort to establish national standards for model railroaders. The popularity of model railroading surged during the economic boom that followed the Second World War. Model Railroader had 100,000 readers by 1950, while throughout the postwar decades, the model train market witnessed the introduction and revitalization of various scales, from 1/160th N-scale to the large G-gauge for outdoor garden railroads. By the 1980s, Wm. K. Walthers Inc. had established itself as the nation’s largest wholesaler of model railroading kits and accessories. The company had also compiled an extensive archive of historical railroad blueprints to foster the ever-important quest authenticity. Meanwhile, the Kalmbach Publishing Co. had distributed a number of specialized model railroading magazines and books that reflected the hobby’s growth, although circulation has steadily declined since the advent of the internet in the early 1990s. While a model railroader spends countless hours in solitude perfecting his work (most are male), thousands of them, from all over the country, make an annual pilgrimage to Milwaukee’s two-day Trainfest, which began as a one-day event in 1972 and is the largest such gathering in the country. Over 20,000 visitors and vendors visit State Fair Park in West Allis, where they learn and share techniques and, of course, run fifty or so model railroads. Similarly, the garden train show at the Mitchell Park Conservatory (the Domes), where larger, G-gauge trains run their loops to a different theme each year, has attracted thousands of visitors since 1996. Of the half-dozen or so clubs in the area, most focus on a certain size of model train and organize get-togethers and small shows throughout the year. A number of groups, such as the Lionel Railroad Club, Milwaukee’s second oldest, open their clubhouses to the public and hold swap meets while modelers now share their work and ideas over the internet. In the early 2000s, the future of model railroading lacked clarity. Actual railroads no longer enjoyed a place in the nation’s popular imagination and some hobbyists argued that young people lacked the patience required by model railroading. By 2010, Wm. Walthers, Inc. and Kalmbach Publishing headed an effort to move model railroading into the twenty-first century, moving into internet media and video while promoting the pastime as “The World’s Greatest Hobby” at shows throughout the country. ^ Erik Gunn, “Choo Choo Crazy,” Milwaukee Magazine, July, 2010, 71. ^ Anthony P. Carideo, “They’ve Been Working on the Railroad,” Milwaukee Journal, 1975, accessed May 1, 2014, http://news.google.com/newspapers?nid=1499&dat=19751031&id=-gcqAAAAIBAJ&sjid=DykEAAAAIBAJ&pg=5122,5731604, accessed June 2015; The station is located underneath the tracks on W. National St., see Allis Station—Milwaukee. Wisconsin—Train Stations/Depots, Waymarking.com, last accessed August 14, 2017. ^ Gunn, “Choo Choo Crazy,” 71. ^ “News & Events,” TrainWeb, accessed June 18, 2015. ^ “Along the Route,” Walthers website, accessed June 15, 2015; For a summary on model railroading scales, see Maribeth Keane, “Train Talk with the National Model Railroad Association’s Brent Lambert,” Collectors Weekly, February 20, 2009, accessed May 10, 2014. ^ Larry Engel, “Model Railroading Typifies Hobby Industry Prospects,” Milwaukee Sentinel, January 16, 1981, accessed May 13, 2014, http://news.google.com/newspapers?nid=1368&dat=19810116&id=54BQAAAAIBAJ&sjid=DRIEAAAAIBAJ&pg=6737,2825472. ^ Roger A. Stafford, “Walthers an Authentic Success,” Milwaukee Sentinel, August 18, 1975, accessed May 20, 2014, http://news.google.com/newspapers?nid=1368&dat=19750818&id=o-0pAAAAIBAJ&sjid=zxEEAAAAIBAJ&pg=7311,3404950. ^ Gunn, “Choo Choo Crazy,” 71; Engel, “Model Railroading Typifies Hobby Industry Prospects”; Darryl Enriquez, “Kalmbach Still at Play at 75,” Milwaukee Journal Sentinel, April 18, 2009, accessed May 15, 2014; “Hobby Magazines and the Future,” Model Railroad Hobbyist Magazine, last modified November 19, 2011. ^ Justin Williams, “Trainfest Draws Thousands to State Fair Park’s Expo Center,” Fox6now.com, November 10, 2013, last accessed August 14, 2017; Gunn, “Choo Choo Crazy,” 71. ^ See Trainfest Fact Sheet, Trainfest website, last accessed August 14, 2017. ^ Jodie Jacobs, “Garden-scale Train Show Chugs to the Wild West,” Chicago Tribune, March 2, 2001, accessed April 22, 2014. ^ For a list of all Wisconsin clubs, see the National Model Railroad Association website, last accessed August 14, 2017. ^ “2014 Schedule of Events,” Lionel Railroad Club website, last accessed August 14, 2017. ^ Gunn, “Choo Choo Crazy,” 74. Gunn notes that cheaper manufacturing in China and the volume of supplies and equipment available to model railroaders demonstrates the bright side of the hobby’s future. The model railroad industry also faced a challenge from Union Pacific Corp in the early 2000s, when the railroad attempted to collect royalty payments for the use of its logo on model cars. See James P. Miller, “Model Train Fans Steaming Mad at UP,” Chicago Tribune, June 27, 2004, accessed May 28, 2014. The freight company settled with manufacturers, allowing the company’s trademarks to be used on models through official licensing agreement. See “The Atlas Companies Sign Licensing Agreement with Union Pacific,” Atlas Model Railroad Co., Inc., September 2004; “U.P., M.T.H. Settle Dispute,” MTH Electric Trains website, November 8, 2006, http://www.mthtrains.com/news/287, now available at http://mthtrains.com/news/287, last accessed August 14, 2017; Trademark & Licensing Info, Walters website, https://www.walthers.com/exec/page/trademarks, accessed 2014. ^ Gunn, “Choo Choo Crazy,” 74. Gunn, Erik. “Choo Choo Crazy.” Milwaukee Magazine 35, no. 7 (July 2010): 68-74.